Pascal Dagnan-Bouveret (1852–1929), Conscripts (1889), oil on canvas, 170 x 150 cm, Assemblée nationale, Paris. Wikimedia Commons. Following the sudden death of the great and very influential Jules Bastien-Lepage, Pascal Dagnan-Bouveret (1852–1929) was the most distinguished and successful painter in ‘Naturalist’ style. After an initial visit to Brittany in 1885, Dagnan-Bouveret turned his attention to that most westerly part of France, a complete change from his earlier works from the Franche-Comté region in the far east of the country. Pascal Dagnan-Bouveret (1852–1929), The Pardon in Brittany (1886), oil on canvas, 114.6 × 84.8 cm, Metropolitan Museum of Art, New York, NY. Wikimedia Commons. 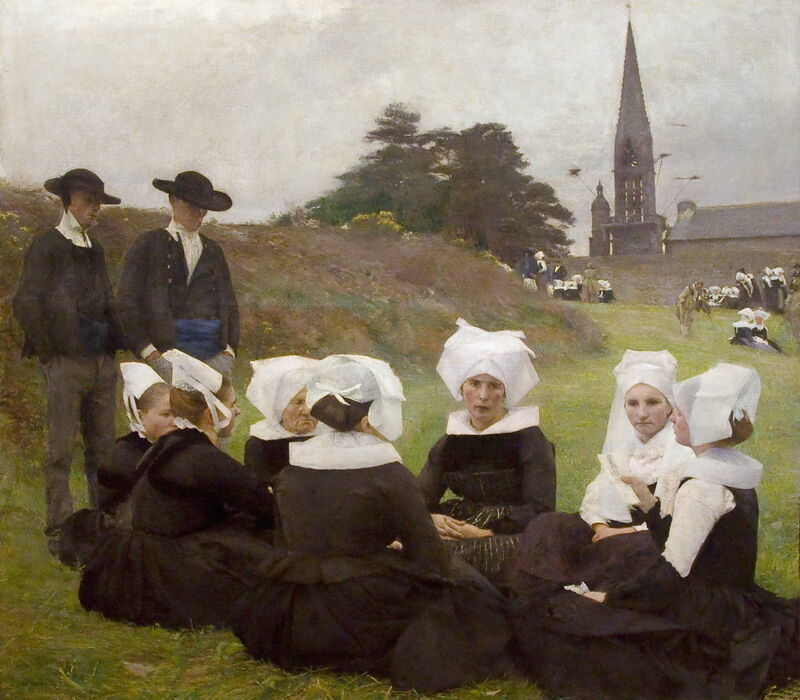 Like the older Jules Breton, Dagnan-Bouveret was fascinated by the extensive religious pilgrimages known as pardons, but does not seem to have attempted to paint large gatherings of pilgrims in a full-scale pardon, like Breton. 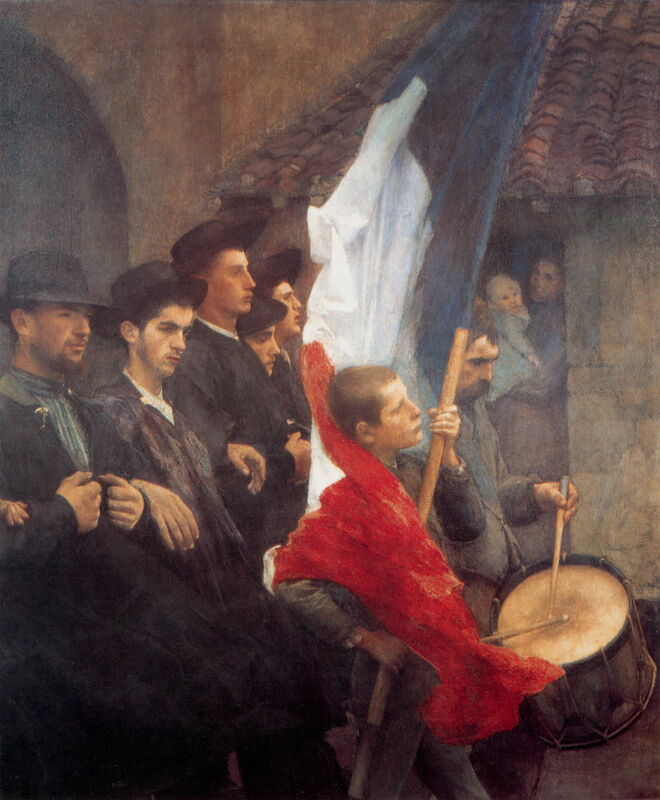 His first painting showing those attending a pardon was completed in 1886, as The Pardon in Brittany. Dagnan-Bouveret shows men and women of all ages walking barefoot, holding lighted candles. The older man with a stick to the left of centre is strongly reminiscent of some in Breton’s earlier paintings of pardons. This painting was awarded a medal of honour at the Exposition Universelle in 1889. Pascal Dagnan-Bouveret (1852–1929), Portrait of a Breton Girl (1887), oil, dimensions and location not known. Wikimedia Commons. 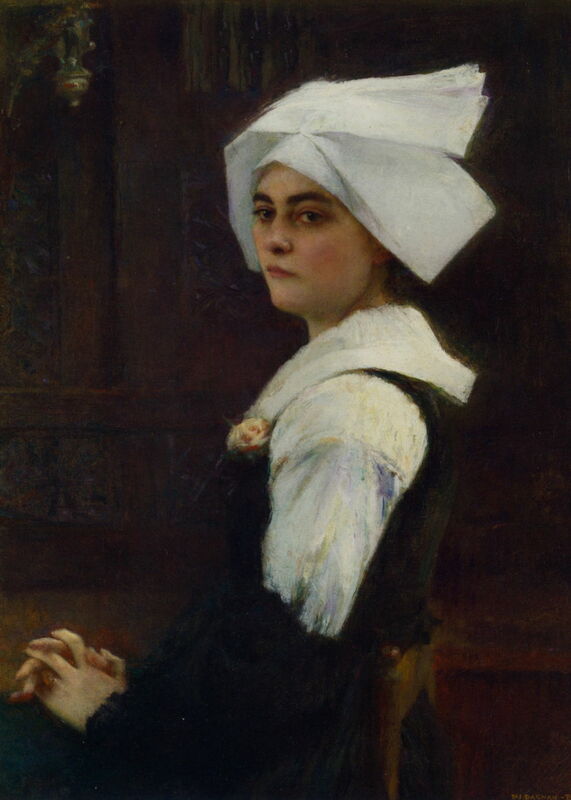 Dagnan-Bouveret prepared for these works conventionally, with studies such as this Portrait of a Breton Girl (1887), and using the radically new technique of photography, and was one of the first painters to employ photography in the production of his paintings. 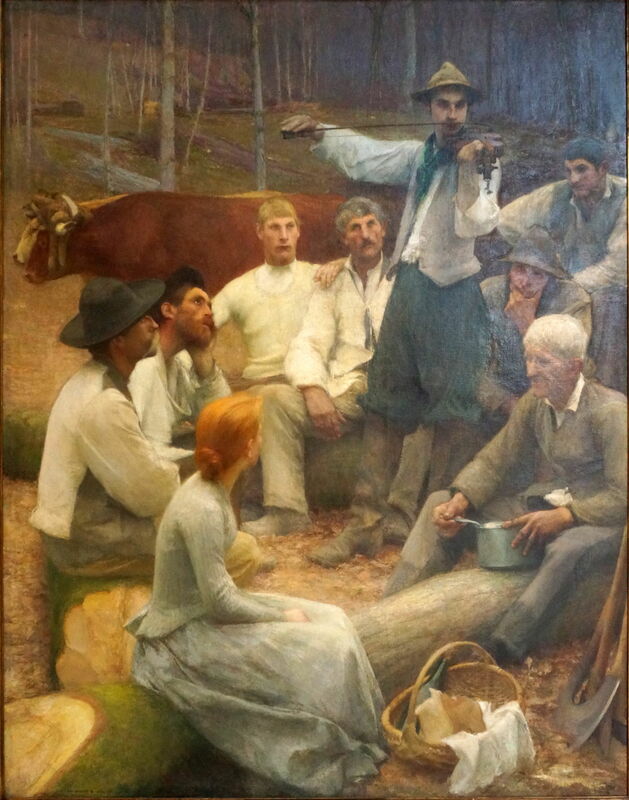 Pascal Dagnan-Bouveret (1852–1929), Bretons at a Pardon (Pardon of Rumengol) (1887), oil on canvas, 125 × 141 cm, Museu Calouste Gulbenkian, Lisbon, Portugal. Image by Paul Hermans, via Wikimedia Commons. 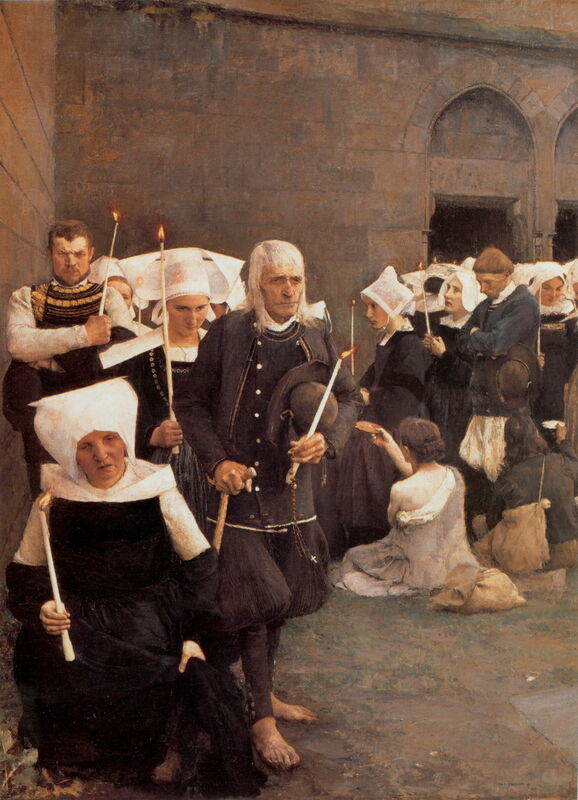 Bretons at a Pardon (1887) shows a group of Breton women attending the Pardon of Rumengol, which takes place in this village to the east of Faou. At least one of the photographs which he took when developing this work survives, but was unsuitable for inclusion here. 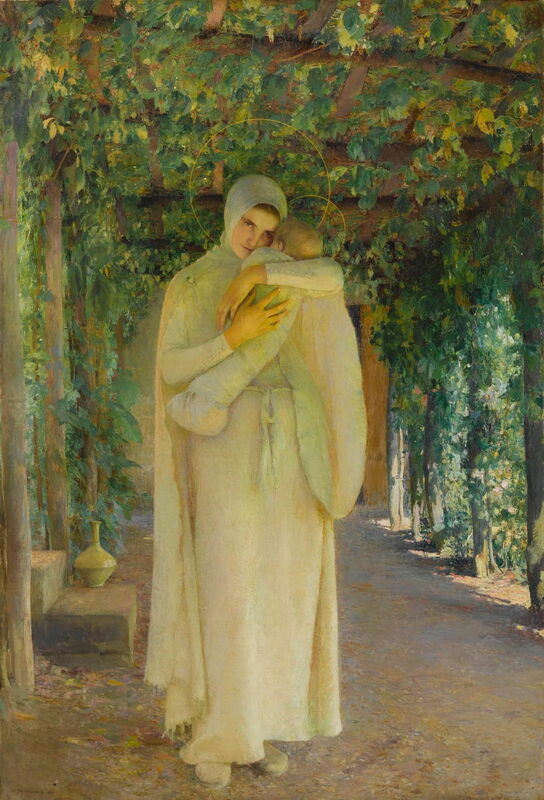 Pascal Dagnan-Bouveret (1852–1929), The Madonna of the Trellis (1888), oil on canvas, 193 x 130.8 cm, location not known. Wikimedia Commons. Dagnan-Bouveret painted a series of modern interpretations of traditional religious works. Among them is his profoundly beautiful Madonna of the Trellis (1888), which shows the Virgin Mary embracing the infant Christ under trellis work with dense foliage. It departs from artistic tradition in that the Madonna is dressed in white, rather than classical ultramarine blue, and has a contemporary appearance. In 1888, Dagnan-Bouveret, Louis-Auguste Girardot and Jules-Alexis Muenier visited Tétouan in Morocco together, although Dagnan-Bouveret doesn’t appear to have left any surviving Orientalist paintings from that trip. He also painted some modern history works, of which the most famous is Conscripts (1889). This shows a group of young men who have just been conscripted into the army, marching behind a very non-military drummer and a boy bearing the national flag. The conscripts walk with their arms linked to express their solidarity. Dagnan-Bouveret delayed exhibiting this painting for two years, then in 1891 it stole the show at the re-organised Salon run by the Société Nationale des Beaux-Arts. It became a runaway success, and a focus for French nationalism. Pascal Dagnan-Bouveret (1852–1929), In the Forest (1893), oil on canvas, dimensions not known, Musée des beaux-arts de Nancy, Nancy, France. Image by G.Garitan, via Wikimedia Commons. Dagnan-Bouveret was at the height of his Naturalism by the early 1890s, and painted another well-known example, his In the Forest of 1893. This shows a group of itinerant people sat together, eating to the sound of a violin. Behind them are two oxen, and the forest which is currently their home. After these two paintings, Dagnan-Bouveret abandoned Naturalism and concentrated his efforts on religious works. 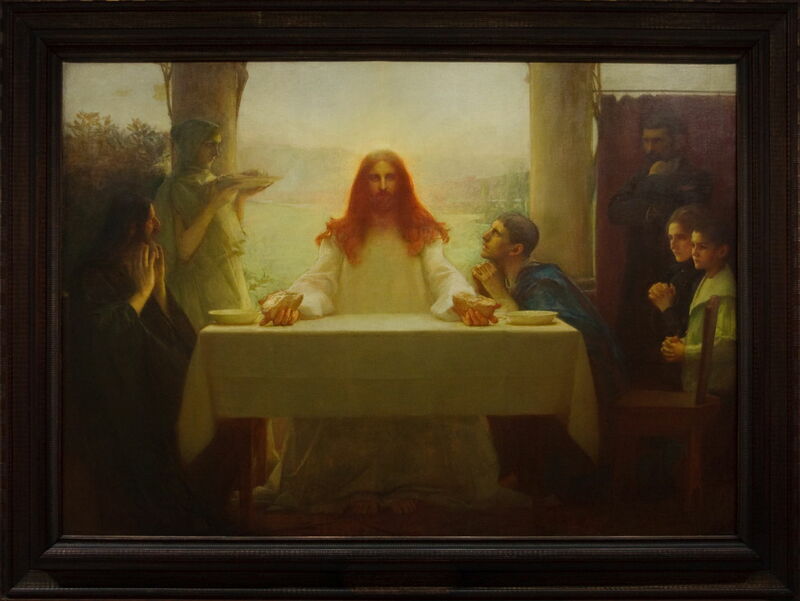 Pascal Dagnan-Bouveret (1852–1929), The Last Supper (1896), oil, dimensions and location not known. Wikimedia Commons. The Last Supper (1896) is probably his most spectacular religious painting, which again follows the artistic tradition in most respects, but with more contemporary figures. Christ is shown blessing the bread and wine, lit from a rich source which doesn’t appear in the painting. Pascal Dagnan-Bouveret (1852–1929), Christ and the Disciples at Emmaus (1896-97), oil on canvas, 198.1 x 280.7 cm, Carnegie Museum of Art, Carnegie Institute, Pittsburgh, PA. Wikimedia Commons. Christ and the Disciples at Emmaus (1896-97) shows an earlier meal during Christ’s ministry, using more contemporary figures and looking into the light. This gives Christ a heavenly radiance, lighting his hair in particular. Pascal Dagnan-Bouveret (1852–1929), Marguerite at the Sabbath (1911), oil on canvas, dimensions not known, Musée municipal de Cognac, Cognac, France. Wikimedia Commons. 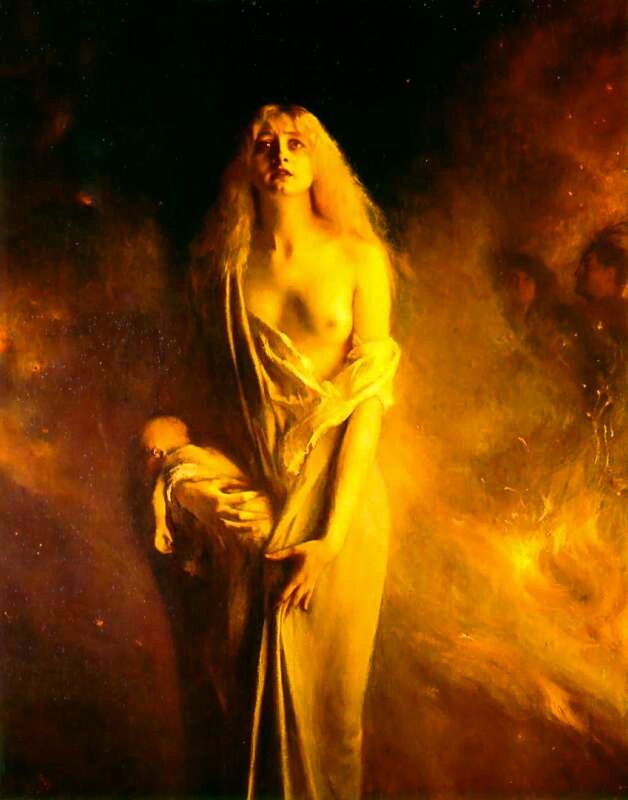 Dagnan-Bouveret uses light to further dramatic effect in his Marguerite at the Sabbath (1911), inspired by the fate of Gretchen/Margaret in Goethe’s Faust. After the birth of her illegitimate child, Margaret drowns the infant in despair, and is shown here clutching his limp body. This is set at the witches Sabbath on Walpurgis Night, lit by the flames of a bonfire. 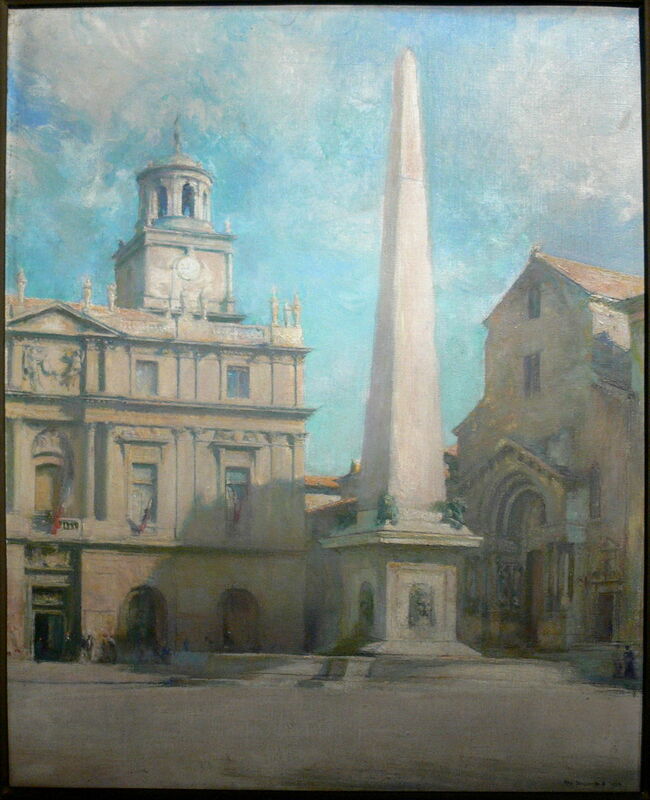 Pascal Dagnan-Bouveret (1852–1929), Saint-Trophime in Arles (1914), oil on canvas, dimensions not known, Musée Georges-Garret, Vesoul, France. Wikimedia Commons. Saint-Trophime in Arles (1914) appears to be a straightforward townscape of the centre of Arles, showing the celebrated ancient Romanesque church of Saint Trophime at the right. Pascal Dagnan-Bouveret (1852–1929), Old Julie, from Quincey (1922), oil on canvas, dimensions not known, Musée Georges-Garret, Vesoul, France. Wikimedia Commons. 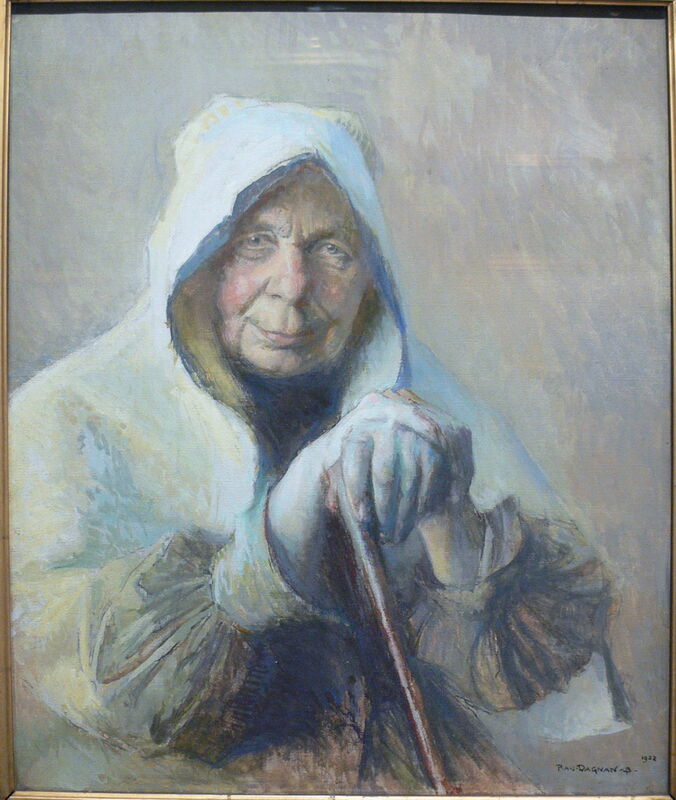 When Dagnan-Bouveret turned seventy in 1922, he painted this wonderful portrait of Old Julie, from Quincey, in the Franche-Comté, where the artist lived; he died there seven years later in 1929. More recent re-assessment of the works of Bastien-Lepage and Dagnan-Bouveret propose that they should be considered together, on a par, as the leaders of the Naturalist movement. History may not have done Bastien-Lepage many favours, but it has been of even greater disservice to Dagnan-Bouveret. Posted in General, Life, Painting and tagged Bastien-Lepage, Breton, Dagnan-Bouveret, naturalism, painting, photography, realism. Bookmark the permalink. Any chance you could switch up your WordPress theme. I can’t see the pictures because the menu is perpetually in the way, and taking up about a third of the screen area. Just a thought. It looks like you have really interesting content, but the format makes it too hard to access, at least on my computer. Which browser and window size are you using? I rather like this (quite expensive) custom theme, and providing access to those menus is important. Striking the balance between providing access to the pages in the menus and the content is always a difficult compromise, and I view the site regularly on a range of devices from iPhones to my 27″ display to try to try to get that right. You may not be aware – although I explain this in several places – that clicking on art images brings them up into a single-image display, which can then normally be magnified. I suggest that you try that to give full access to the images shown. At present I’m just using a laptop (usually I have my large monitor hooked up to it, but not right now). Also using Firefox. Tested it in Chrome and there are the same issues. However, in Firefox if I have my bookmarks visible on the side than your buttons will condense into the stacked line icon, which is way, way better. People know to click on that to see the menu anyway. Also, you right sidebar and search option together take up at least a third of the viewing area. Personally, I think it’s better to have the buttons disappear when you scroll down, b/c we know we can scroll back up and see them. You can look at my blog for this. If you are reading an article, you just see the text and images full screen once you’ve scrolled down a bit. Each day I check the pages using Safari on an old white MacBook running macOS 10.6.8, and that doesn’t have the problems which you are seeing! This is in part a browser issue: on that system, and all the others that I have access to, the behaviour is exactly as you describe in your final para – the moment that you scroll down, the main header and menu move off the top of the window, leaving just a thin ribbon menu. I’m not sure why Firefox and Chrome are not doing that for you. Sidebar scaling is another thorny issue. That is rather simpler, because in this theme (as with most), you either have a sidebar, or you don’t. The penalties of not having one at all make it almost essential to have one, so there really isn’t much I can do about that. With this sort of theme, there is limited scope for tweaking such details. I am loathe to abandon the theme altogether, which would be the only practical option, as I haven’t seen another which I like as much. I spend quite a lot of time editing each page to enable the feature which lets you click on each image to view it without any furniture, which is by far the best solution for looking at paintings. I strongly recommend that you use it to view the images properly. Yeah, but who uses Safari and an old Mac book? Most people are going to be running a PC and using Firefox or Chrome. I used to use a right sidebar as well, but went for a cleaner look. The extras are on the bottom or the top, and it seems to not be a problem. I’m just making a suggestion because you have excellent content, but it’s actually, for my set-up, nearly impossible to read. Sure, I can click on the pics (better if they open in a new tab), but even the text I’m having to read just several lines at a time. I mention this only because your them is particularly hard for me to read among all the ones I’ve looked at recently, while also having some of the very best content. You might see if other people can read it easily or not, besides just me. If it’s not just me, than you might wanna’ tweak out the theme one way or another, or, aaaaaaaa! choose another one (I hear ya’ on not wanting to change it!). 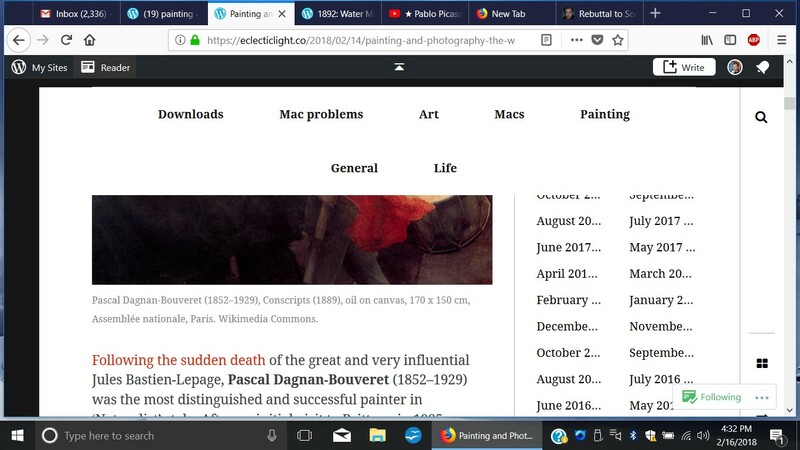 As this blog is as much about Macs as it is about art, a lot of viewers here are using Macs, and many of them relatively old systems like that MacBook. For a single-topic blog, your theme may work very well. Remember that this blog covers everything from deep macOS internals to pretty pictures, and providing good access to all that content is more complex. Gotcha. Normally I have my laptop (my other one, in fact) set up to a big monitor, in which case this wouldn’t be such an issue. This is my super cheap laptop I use while traveling just for the net. That’s effectively a 1366 x 768 display! With the greatest of respect, redesigning my site to work with that on a non-mobile device would be throwing the baby out with the bathwater. I don’t know if you can switch the browser to behave as a mobile device, but you’d see better results if it pretended that it was an iPhone in landscape mode. I should also point out that the uppermost area in that window is taken up by the WordPress menu bar which is imposed because you have a WordPress blog: I can’t turn that off for you.